This book is a collection for four novellas by the authors listed above that are easy to read, enjoyable and entertaining. The female characters are strong and sassy, but God-fearing too. The male characters think they know what they want in a woman, but bow to God’s greater wisdom in giving them the women they need. “And Then Came Spring” by Margaret Brownley tells the story of Mary-Jo Parker, a mail-order bride who is left standing at the train station by her fiancé. What she soon discovers is there is a very good reason for that…he is dead. This is her second fiancé who has died before reaching the altar. She meets her fiancé’s brother and her fiancé’s son. They convince her to stay to get to know them better. Mary-Jo doubts her luck will hold as she has never had anything but bad luck. She makes sure to not step on cracks or walk under ladders and to throw spilled salt over the left shoulder. She has forgotten to trust in God, not in luck. There are some funny moments to this charming story. There is a hilarious Glossary of Mail-Order Bride Terms (And What They Really Mean) following the story’s conclusion. “An Ever After Summer” by Debra Clopton introduces us to Melvina Eldora Smith or “Murderin’ Melvina”. She, in her aunt’s mind, killed three people before she turned one. The rest of the town picked up on the nickname and relentlessly teased her and treated her as an outcast. No man in Fort Worth would have her as a wife, so her aunt makes her choose an ad in a copy of the mail-order bride catalogue. Mathew McConnell advertised for a wife, but he really just wants a mother for his 2-year-old daughter. He definitely doesn’t want a Bible thumper! Melvina, or Ellie as she now likes to be called, has a new name for a new life, steps off the stagecoach clutching a Bible. Mathew refuses to love again after the death of his wife and Ellie is determined and optimistic about her new life and that God will give her the delights of her heart, namely a husband and children. “Autumn Angel” by Robin Lee Hatcher gives us the story of Clay Birch, an enterprising Christian man trying to bring the first opera house of Grand Coeur in the Idaho Territory. He is tired of being alone and wants someone to help get his opera house off the ground. He advertises in a mail-order bride catalogue with his main stipulation for a wife as one with no children. When Luvena Abbott arrives with three children in tow, he immediately decides there will be no wedding. Now what is Luvena supposed to do? She has traveled all the way from Massachusetts to escape her family’s disgrace. She has no money for return fare and neither does Clay. Luvena knows God has led her here, but can Clay arrive at the same conclusion? Can he learn to love the children as God loves His children? 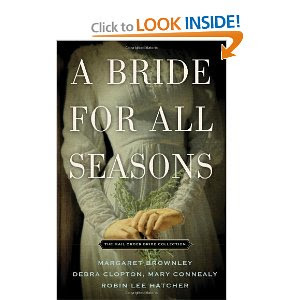 “Winter Wedding Bells” by Mary Connealy tells the story of David Laramie Megan McBride. Megan needs a place to live and David needs a wife to care for his young sons as his doctor has told him he is dying. Megan refuses to believe the doctor and sets about to cure him. While attempting her cure, David rushes to teach her all about ranch life. Everyone on the ranch loves her cooking, and David begins to think maybe he might live. He likes his sassy new wife and she takes good care of his boys. Will her cure work for him? A ranch hand brings home a cold and gives it to David and the boys. David runs a fever. Will he survive this illness in his already weakened state of health? I enjoyed the spirit and fire exhibited by the women in these stories. They showed grit and determination to make the best of their situations. The humor in some of the stories was terrific and left me wanting more laughs. These are all charming stories that will draw the reader in and entertain with four different romances that aren’t connected, so readers can read them in any order. The number of pages the stories have make them attractive as well; readers can easily read one in a day. I think anyone who is looking for a light, well-written short story will like these novellas.